Zoe is a little girl who's bored, ignored, and living a life void of meaning. To escape the drudgery of the real world, she flees to the imaginary land of Quidam. There Zoe meets uplifting characters full of cheer, who encourage us all to free our souls. Cirque du Soleil's ninth production is about expressing individuality, living your dreams, and standing out from the crowd. If you want to know what that means, all you have to do is meet John, the ringmaster, whose purple 'spare-do' will have you fearing for your locks. Then there's The Target, Zoe's closet friend in Quidam. The mime exists in 'empty space, meaning he is here and not here at the same time. 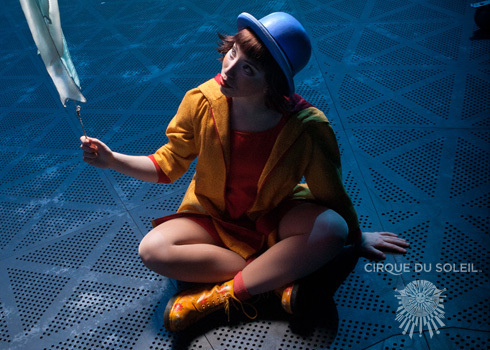 Quidam is invading the minds of audiences around the world, and will be popping into the brains of Londoners between the 4th January - 9th February, where they will be performing at the Royal Albert Hall. Standard tickets start from £20 for adults and £14 for children, and range to £85 for premium seats. As well as being immersed in a fantastical storyline, you'll also get to see all the fabulous circus acts, such as aerial contortionists, banquine acrobatics, the diablo, and a skipping performance that will put school kids to shame. Of course, you can't have a circus without a clown, and this clown likes audience participation.